A look at wartime Britain, often with a London slant. Usually the Second World War but sometimes the First. Zeppelins, The Blitz, Battle of Britain, V Weapons. Local heroes and villains, the equipment, the offbeat. Book reviews and sometimes films as well. You name it, we've covered it - come and join the party! The article below first appeared on this blog in June 2010 but following the receipt of some new photographs from Captain Binney's Great Niece, along with one or two fresh pieces of information, it seems a good time to reproduce the article below, duly updated. Today, seventy years on from the end of the Second World War, it is easy to look back on life in London and imagine that the populace were to a man and woman, all pulling together with the "London Can Take It" attitude made so popular by the media of the time. Yet, whilst it is true that most law abiding Londoners did indeed get on with their lives as normally as they could, stoically keeping calm and carrying on, there was another section of the London population for whom the war also meant business as usual. Then as now, London had a significant criminal population although today many people seem to forget that 'normal' crimes still occurred in wartime. However, the war meant nothing to these people - indeed in many ways wartime conditions with the blackout and with the huge influx of service personnel into London made life much easier for the criminal fraternity. Today, in Birchin Lane in the City of London, many people must have walked past the unassuming black plaque on the wall of what is now a sandwich shop without giving it a moment's thought. Closer examination of the plaque reveals that it marks the scene of one of London's most notorious wartime crimes and celebrates the memory of one of the heroes of wartime London, a Royal Navy officer who died not in action with the enemy but in trying to thwart this violent crime. 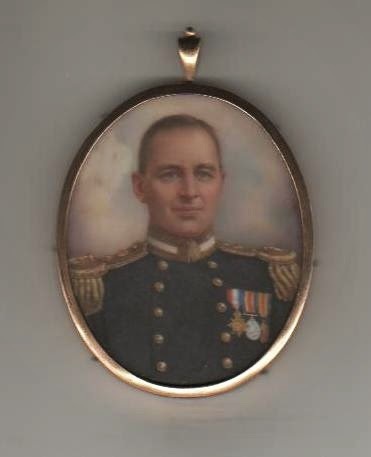 Ralph Douglas Binney was born in Cookham, Berkshire on 14th October 1888 and joined the Royal Navy as a Midshipman in 1903. 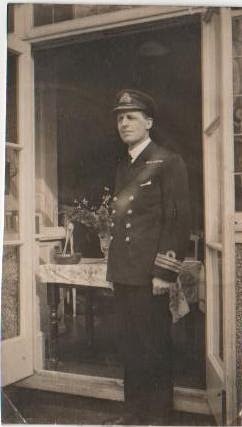 Promoted to Sub-Lieutenant in 1907, he served in the Great War in various appointments and postwar in the battleship HMS Royal Sovereign before eventually taking his first command, the monitor HMS Marshall Soult in 1930. 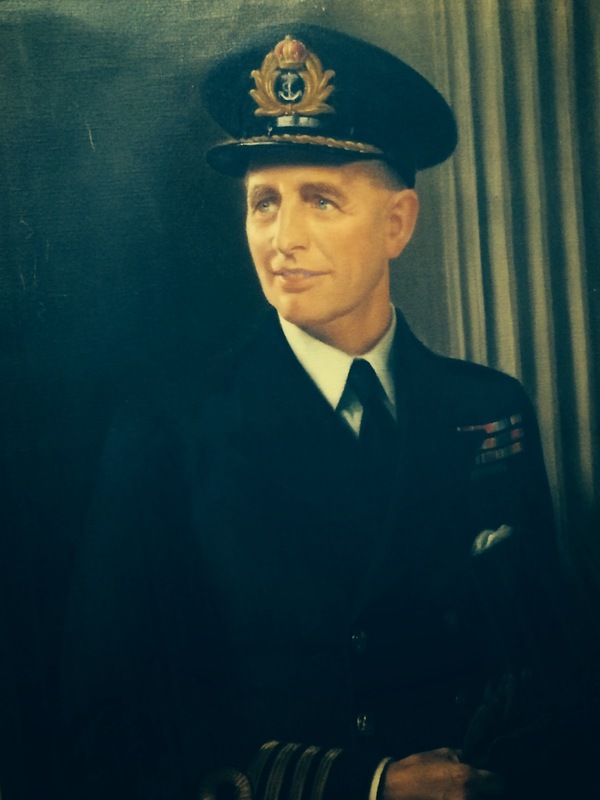 In 1934, on the completion of a final shore appointment at The Admiralty he was promoted to Captain and placed on the retired list, seemingly the end of a blameless career in the Royal Navy. From 1934-39, he served with the Colombian Navy and was instrumental in the setting up of their naval cadet and officer training system. He was extremely well thought of in Colombia and indeed today there is still an annual "Binney" Class within the Escuela Naval Almirante Padilla's intake of cadets. On the outbreak of war in 1939 in common with many retired officers, he was recalled to the Royal Navy and had a series of staff appointments, most notably as Flag Captain of HMS Nile, the naval base at Alexandria. In January 1943, he was appointed CBE and was back in the UK serving as Chief of Staff to the Flag Officer in Command of the London Area. So it was on December 8th 1944 whilst walking along Birchin Lane, no doubt on his way to or from a meeting, Captain Binney came across an armed robbery in progress at Wordley's jewellery shop. A man had swung an axe, smashed the shop window and was rushing across the road to a waiting getaway car carrying a tray of jewellery worth approximately £ 3,500 at 1944 prices. As the car pulled away, Binney ran into the road in an attempt to jump on the running board to stop the getaway but instead of stopping, the driver merely accelerated, causing the Captain to slip beneath the car and to be run over. By this time, a member of the public had blocked the road with another vehicle, so the desperate men reversed their car and ran over Binney once again, this time somehow trapping him beneath their car. As they sped away, horrified onlookers could hear the Captain calling for help but he remained trapped beneath the car until after they had crossed London Bridge, when he was jarred free of the car in Tooley Street, just south of the River Thames. Taken to nearby Guy's Hospital, Captain Binney died three hours later but before he died, the getaway vehicle was found abandoned further along Tooley Street. The Police launched a massive manhunt and felt certain that the robbers were both local men who knew their area well. After over 200 known criminals had been rounded up during a three week hunt, detectives learned that two local men, Thomas Jenkins, in his 30s and Ronald Hedley, 26 were still unaccounted for. After further searches, these men were quickly picked up - Jenkins in Woking, whilst an informant gave up Hedley who was found hiding out in Jamaica Road, very close to where the car had been abandoned. Both men were habitual criminals and had spent their lives in and out of prison. Although both men denied any involvement in the robbery and subsequent murder of Captain Binney, they were identified by the many eye witnesses of the incident and were subsequently charged with both the robbery itself and the murder of the Captain. On March 6th 1945, they stood trial and whilst they both admitted to knowing each other slightly, they still denied all knowledge or involvement in the robbery and murder. Despite this testimony, the jury took only an hour and a half to find both men guilty. Hedley, the car driver was convicted of murder and sentenced to death by hanging, whilst Jenkins was found guilty of manslaughter and sentenced to 8 years imprisonment. However, the day before Hedley's sentence was due to be carried out, it was commuted to life imprisonment. 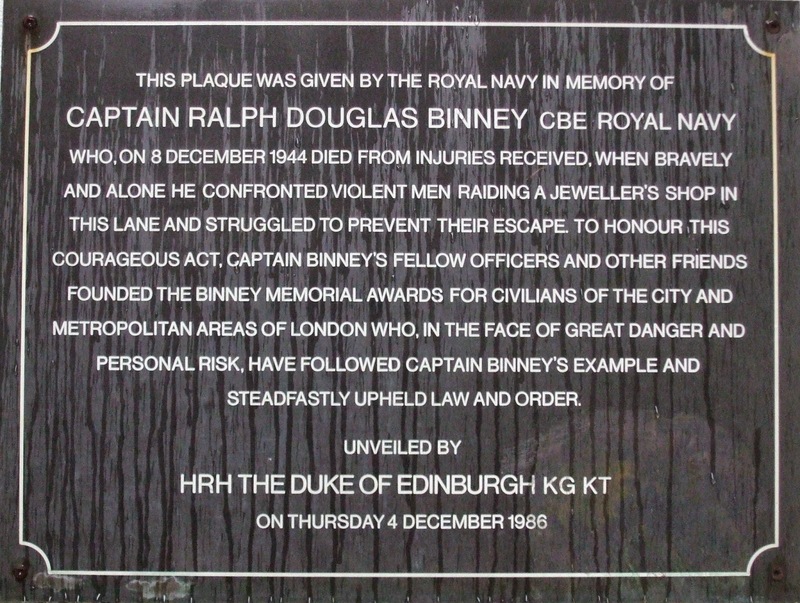 As a result of Captain Binney's selfless action, his fellow officers in the Royal Navy established a trust fund to enable an annual award to be made to members of the public who put themselves at great personal risk in attempting to intervene in violent crimes in the Metropolitan and City of London Police areas. The Binney Award has today been absorbed into the annual Police Public Bravery Awards but incorporates the award of a Binney Medal which is proudly presented every summer by the Captain's Great Niece, Caroline Brodrick to "The Bravest in The Land" and thus keeps alive the name of a man who died upholding the finest traditions of the Royal Navy, albeit in extremely unusual circumstances and surroundings.